The earthquake with an estimated magnitude of Mw 8.1 (moment magnitude) occurring at a depth of approximately 70 km along the Middle America Trench, a subduction zone stretching off shore the Pacific coast of Mexico and large parts of Central America. The distance of the earthquake’s estimated epicenter to the southern coast of the state Chiapas is approximately 70 km. So far, some fatalities have been reported from the states Chiapas and Oaxaca, those states that are located closest to the epicenter. It is also expected that parts of Guatemala, bordering to the southeast of Chiapas and being only located in 170 km distance, were affected as well. Local authorities released a tsunami warning immediately after the earthquake happened. This, however, was most likely automatically done since the earthquake was released from a subduction zone and having a large magnitude. Significant tsunami waves have not been reported so far. Judging from the earthquake’s magnitude, its depth and distance to the coast, as well as the fact that the states being closest to the epicenter are among the poorest regions of Mexico, it must be estimated that widespread damage and destruction was caused by this event. 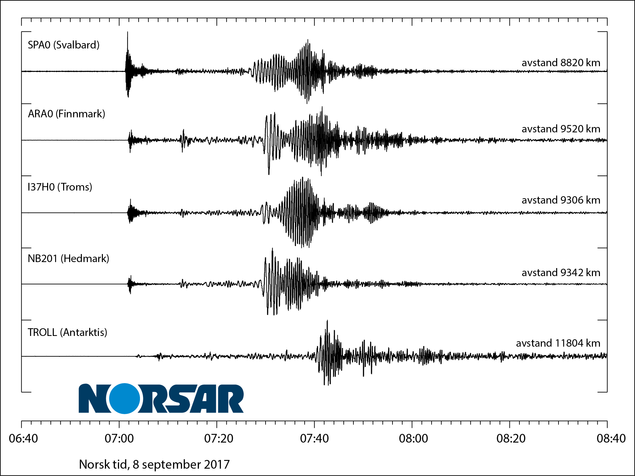 The figure above shows recordings of the earthquake at five of NORSAR’s seismological stations located in Norway, on Spitsbergen as well as in Antarctica. The waveforms at approximately 7:00 am (Norwegian time) represent seismic waves traveling through the Earth’s interior while the larger amplitudes between 7:30 and 7:45 am are due to waves that are propagating along the Earth’s surface.